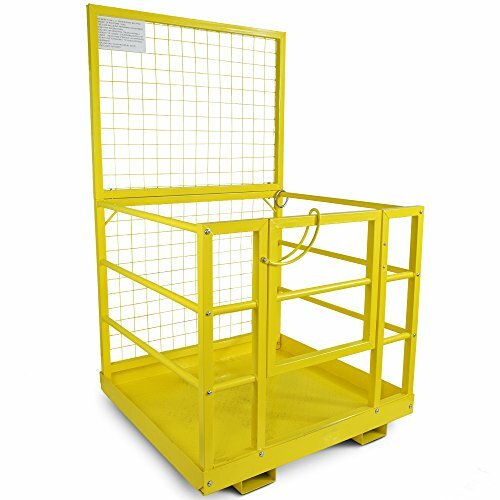 The LW safety lift platform cage from Titan is designed for use with any standard forklift or pallet loader. The pallet fork sleeves on the bottom of the platform run the entire 43" length of the cage and lock in place with pins for maximum security and stability.The spring loaded, inward closing door and automatic drop lock prevent accidental opening while the cage is in use. With enough room for 2 people to move around, this platform is perfect for most aerial jobs like changing lights, painting, roof repair, or tree service. The LW model is the same as the standard Titan Work platform cage, except with a slightly smaller door, and lighter weight mesh on the back screen. It is designed to work better with lower capacity forklifts without sacrificing safety or capacity. - Fork Slots: 6.25" x 2.5"
- Spring loaded inward closing door - Automatic Drop Lock - Yellow Powder Coated Finish - Height: 75"
We need your phone number! For the trucking company to schedule delivery. Without it there will be delays.